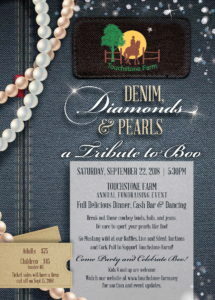 Please join us for a memorable evening to honor Boo and help raise funds for the farm! * or until the last person leaves the dance floor! Complementary Champagne Toast & Cash Bar! Appetizers, Entree Stations & Dessert! Awesome Silent Auction and Cork Pull! Line Dancing with the Mavericks! Reflections and Sharing of our favorite “Boo” Memories! 2. Choose the NUMBER of tickets of this TYPE. 4. CONTINUE SHOPPING for additional event tickets by TYPE if purchasing different types. Choose the NUMBER and ADD to cart. – Note, the NAME, ADDRESS, PHONE & EMAIL along with the TICKET TYPE of each participant. If their contact info is different than yours, please add that for each person as well. A 4% service charge is added to your CREDIT CARD PURCHASES, ONLINE OR MAIL-IN. To avoid this service charge, DOWNLOAD the Ticket Order form from this page and MAIL IN your check payment. Ticket refunds and transfers are issued ONLY in the case that Touchstone Farm is unable to hold the event due to unforseen circumstanes. * Again, noting the contact info for all participants as well as dietary restrictions, Thank you! If you have DIETARY concerns, please type in the NOTES SECTION of your shopping cart with your event tickets: – Gluten free, Vegetarian, Vegan or any other food allergy concerns. * Please include the names phone and email for each member required for any follow up questions we may have. Thank you! IN THE NOTES SECTION OF THE CHECK OUT PROCESS, PLEASE WRITE THE NAME AND TICKET TYPE OF EACH EVENT PARTICIPANT. IF THEIR CONTACT INFORMATION IS DIFFERENT THAN YOURS, PLEASE ADD THE INFO TO EACH PERSON LISTED. THANK YOU!